... is Katya because of her exquisite work: Cape Collar Jacket by Vladimir Teriokhin. 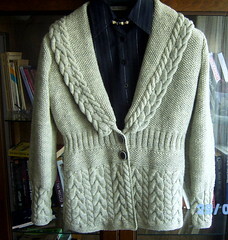 It's a pattern design from Vogue Knitting magazine (pattern #16), Winter 2007/2008 issue. Vladimir Teriokhin is one of may favorite designers too. His beautiful designs are in every issue of VK. Congratulations Katya! I always admire your work but this one drew my attention instantly. A lovely pick indeed. That jacket is stunning! I'm working in association with Early Moments, a children's book club that can help you teach your kids how to read with children's books. Early Moments can help with a child's early literacy development by providing award-winning children's and kid's books conveniently delivered to their door. I feel the information on your site you provide is very useful and your visitors may be interested. I would love to know if you could link to our website, Early Moments.